Long Beach, Calif. – June 2, 2012 – Formula DRIFT returned to Round 3: Invasion at Palm Beach International Raceway for the second consecutive year. Rookie Daigo Saito in the Achilles Tire / Bridges Racing Lexus SC430 takes the victory and closes in on the points leader Justin Pawlak in the Falken Tire Ford Mustang. Round 3: Invasion saw an increase in attendance in the second year of competition at Palm Beach International Raceway. The Driftstream saw over 200,000 viewers in a 24 hour period. Points leader and winner of last year’s Palm Beach event, Justin Pawlak and the 2011 Formula DRIFT Champion, Daijiro Yoshihara in the Discount Tire / Falken Tire Nissan 240SX faced off in a battle for third place. 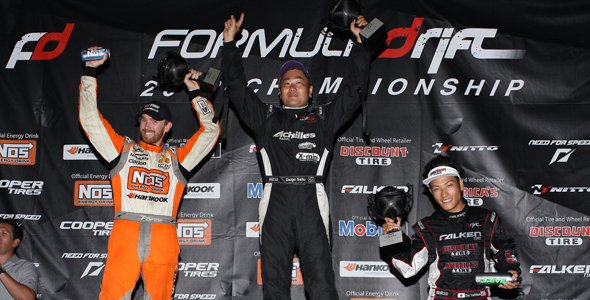 Yoshihara took the win after Pawlak spun out on his chase run and moves into third place overall. The final match of evening pitted Chris Forsberg in the NOS Energy / Hankook Tire Nissan 370Z against Formula DRIFT rookie Daigo Saito. After a close battle Saito was crowned the winner and has now found the podium for the third consecutive event and increases his chances to win the coveted rookie of the year honors. The Formula DRIFT Pro Championship continues with Round 4: The Gauntlet on June 22-23, 2012 at Wall Speedway.